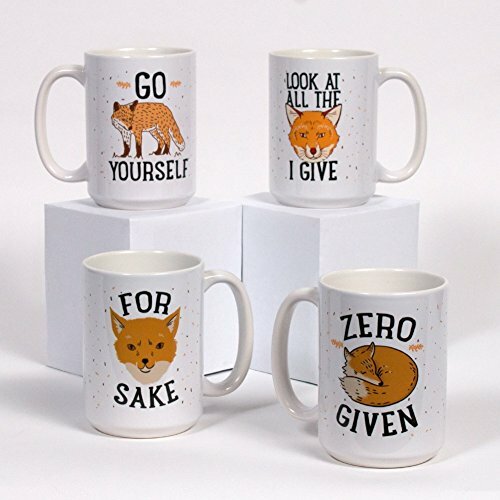 These mugs are perfect for the sassy fox lover who can't help but give zero fox when it comes to what is going on. If you love puns and letting people know that you can't be bothered grab these unique coffee mugs and let everyone at work know you aren't in to today. The set includes four 15 ounce, full color, microwave safe coffee mugs. The "Zero Fox Given" mug set includes our four best sassy fox designs. Let your coworkers and friends know that you can't be bothered with what's going on. Our 15-ounce Mugs features large handles for easy gripping and a wrap-around print. These heavy-duty Mugs are both dishwasher and microwave safe. Printed in the USA. For amazing products and great customer service, please make sure you choose "LookHuman" as the seller.